It was a crisp day in September when carloads of local leaders and business owners from around the Olympic Peninsula began arriving at the Skokomish Grange. 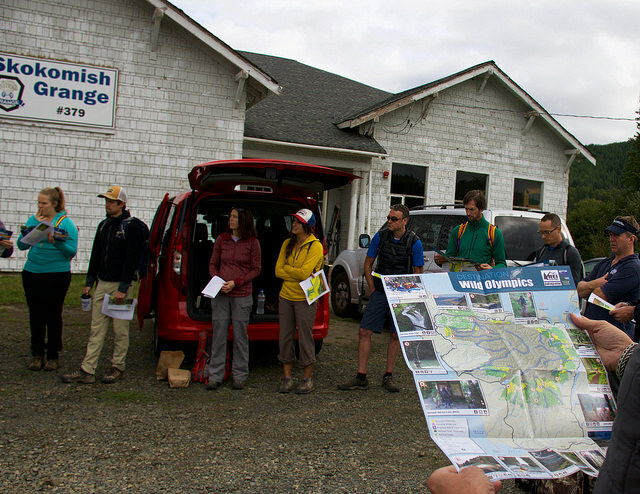 From all walks of life, the small crowd began to socialize, eager to start hiking along the always-immaculate South Fork of the Skokomish River. Elected officials chatted with nature writers, while tour guides and business owners mingled together in the warming temperatures. We were all there for a trail chat, hosted by leaders of REI and Patagonia, two major supporters of Wild Olympics and outdoor advocacy issues around the world. They were meeting with leaders of business and recreation around the Olympic Peninsula to better understand why we are all so passionate about protecting and supporting the Wild Olympics act. Supported by 550 total endorsements from local elected officials, conservation groups, local business and Sportsmen groups, the movement had caught their attention and they wanted to know more. 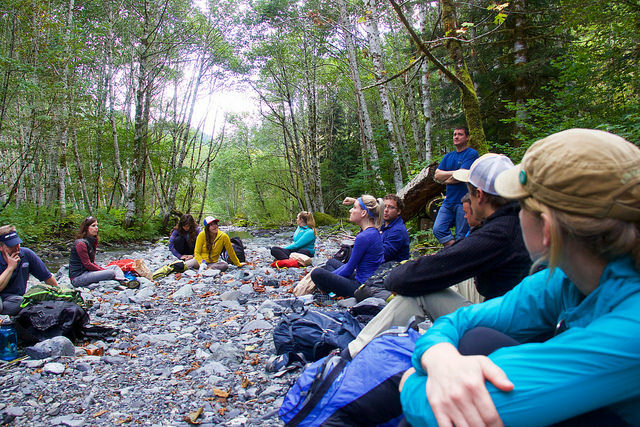 The Wild Olympic Trail Chat, hosted by REI and Patagonia, was a way to showcase and highlight one of the gorgeous lands located in the proposed Wild Olympics Wilderness and Wild & Scenic Rivers Act; and it did just that. 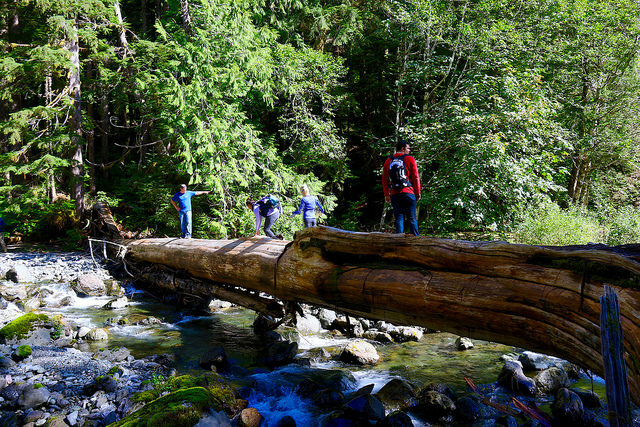 Led by renowned Olympic expert and Olympic National Park poet laureate Tim McNulty, the crew hiked the Upper Skokomish River Trail, weaving through incredible stands of old growth timber that towered above the handful of Wild Olympics’ supporters. Every few hundred yards, Tim would point out something unique and fascinating about the trail and the forest. 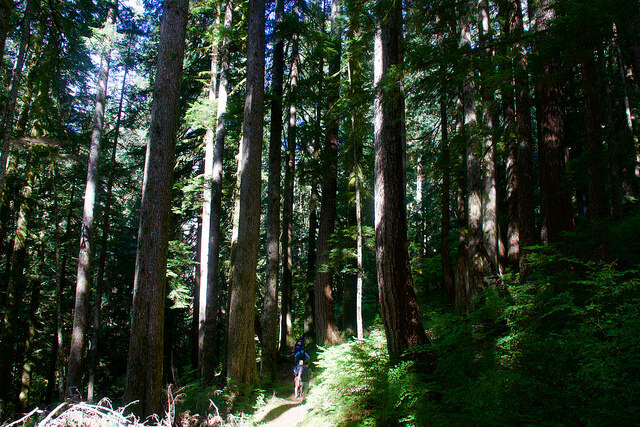 From giant rocks placed along the side of the trail by glaciers to showcasing the slide alders and mammoth trees spread throughout the area, the beauty of South Fork Skokomish grew with every step. Here in the proposed wilderness, the group entered a timeless region, mostly untouched by humanity. As the crew of business leaders and officials walked on, the conversation dwindled and soon we were walking in mostly silence. As the light wind rustled the branches high above, we crossed fallen wooden giants, now used as makeshift bridges. The wild spirit of the region consumed us all, transforming a short day hike into a memorable trip into pristine nature. Anywhere else in the country, this stretch of the South Fork of the Skokomish River would be protected for generations to come, rightfully designated as a wilderness area and a Wild and Scenic River. Out in the Wild Olympics, the South Fork of the Skokomish is yet another overlooked regional gem, chalked up as yet another stretch of forest in the seemingly endless blanket of vegetation that covers the region. Those who haven’t hiked the upper portions of the South Fork of the Skokomish are missing out on a wonderful and magical trail. Starting out on the remains of an old logging and forest service road, the path quickly meets up with an old wooden trail marker that serves as the gateway to unrivaled majesty in the southeastern corner of the Olympic Peninsula. As the trail works its way next to a stunning box canyon, quick glimpses of the waters below fuel wanderlust and excitement. Eventually, the trail descends, giving a view down the narrow, box canyon from a fun wooden bridge crossing. In the spring, this area is a raging torrent of water, flushing all of the meltwater from the snows in the mountains above. On this late summer day, the water was minimal, slowly sauntering past the forest-lined banks, as if it was enjoying the last moments of summer. Past the Rule Creek bridge, the trail once again changes, this time leading into stand after stand of tall cedars and firs, appearing to scrape the sky, high above. 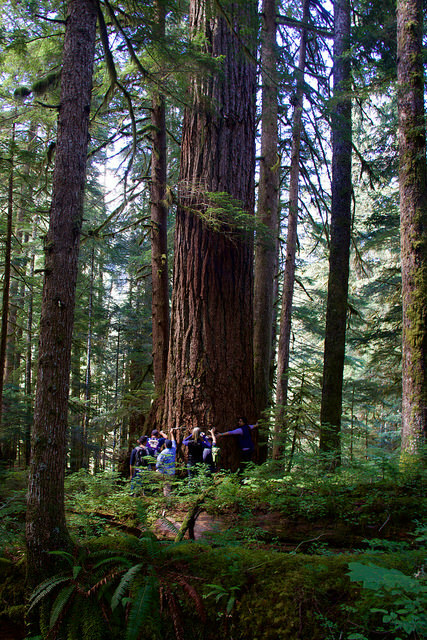 With trees measuring 28 feet in circumference and stretching hundreds of feet tall, the seemingly endless grove of trees is as breathtaking as anywhere in the Pacific Northwest. Broken up by a unique bridge of a fallen tree which helps hikers cross the South Fork of the Skokomish River, the stands of ancient forests leave all who visit with a sense of wonder and astonishment. Eventually, the trail once again reaches the Skokomish River, but with no bridges to cross the waters. In the spring, downfall can be located upstream to facilitate a crossing. In the late summer months, when Wild Olympics took a trip with REI and Patagonia, the river was running low, easily crossed without much effort at all. The trail continues to climb the slopes past this point, eventually leading into Olympic National Park and Sundown Pass and Lake; but, for most, this is a picturesque stopping point. The Upper South Fork Skokomish Trail is a breathtaking reminder of the beauty that the Wild Olympics Wilderness and Wild & Scenic Rivers Act possesses. It is where giant trees have stood against the weather and the advances of society, protected by a wild and remote landscape. High above Hood Canal, the South Fork of the Skokomish is a spiritually rich and historical region worthy of our love and protection for future uses. During our talks with outdoor industry professionals, political representatives and local business owners, the feeling was mutual. This and the other regions of the Wild Olympics need to be protected now. The Wild Olympics Wilderness and Wild & Scenic Rivers Act was reintroduced last year by U.S. Senator Patty Murray and Representative Derek Kilmer. The bill would permanently protect over 126,000 acres of new Wilderness areas in the Olympic National Forest, and 19 Olympic Peninsula rivers and their tributaries as Wild & Scenic Rivers – the first ever Wild & Scenic Rivers on the Peninsula. Designed through extensive community input to protect ancient forests, clean water, and enhance outdoor recreation, the Wild Olympics legislation has been endorsed by over 550 local businesses, sportsmen organizations, outdoor recreation groups, faith leaders, conservation groups and local elected officials; and more than 12,000 local residents have signed petitions in support. Sign the petition and help preserve these amazing lands. This article was written by Douglas Scott. Through his numerous guidebooks, including the Definitive Guide to Olympic National Park and 52 Hikes Olympic Peninsula, the best trails and experiences in and around the Wild Olympics can be found. More information of Douglas and his work can be found at Outdoor-Society.com.